Quantifying actual and theoretical ethanol yields from biomass conversion processes such as simultanteous saccharification and fermentation (SSF) requires expensive, complex fermentation assays, and extensive compositional analyses of the biomass sample. Near-infrared reflectance spectroscopy (NIRS) is a non-destructive technology that can be used to obtain rapid, low-cost, high-throughput, and accurate estimates of agricultural product composition. In this study, broad-based NIRS calibrations were developed for switchgrass biomass that can be used to estimate over 20 components including cell wall and soluble sugars and also ethanol production and pentose sugars released as measured using a laboratory SSF procedure. With this information, an additional 13 complex feedstock traits can be determined including theoretical and actual ethanol yields from hexose fermentation. 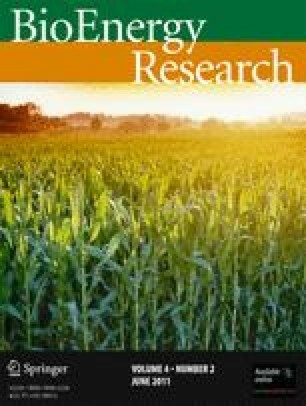 The NIRS calibrations were used to estimate feedstock composition and conversion information for biomass samples from a multi-year switchgrass (Panicum virgatum L.) biomass cultivar evaluation trial. There were significant differences among switchgrass strains for all biomass conversion and composition traits including actual ethanol yields, ETOHL (L Mg−1) and theoretical ethanol yields, ETOHTL (L Mg−1), based on cell wall and non-cell wall composition NIRS analyses. ETOHL means ranged from 98 to 115 L Mg−1 while ETOHTL means ranged from 203 to 222 L Mg−1. Because of differences in both biomass yields and conversion efficiency, there were significant differences among strains for both actual (2,534–3,720 L ha−1) and theoretical (4,878–7,888 L ha−1) ethanol production per hectare. It should be feasible to improve ethanol yields per hectare by improving both biomass yield and conversion efficiency by using NIRS analyses to quantify differences among cultivars and management practices. For abbreviations used in this paper, please refer to Table 1. USDA neither guarantees nor warrants the standard of the product, and the use of the name by USDA implies no approval of the product to the exclusion of others that may also be suitable. Ms. Patricia O’Bryan and Mr. Ted Joe are acknowledged for their excellent technical support in conducting the laboratory fermentation and composition experiments. Dowe N, McMillan J (2001) SSF Experimental Protocols—Lignocellulosic Biomass Hydrolysis and Fermentation; Laboratory Analytical Procedure (LAP). National Renewable Energy Laboratory, NREL/TP-510-42630. Available at http://www.nrel.gov/biomass/pdfs/42630.pdf. Accessed 08 Jan 09.